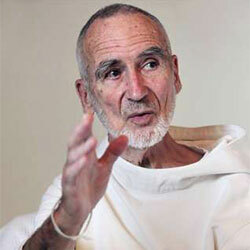 David Steindl-Rast was born in 1926, in Vienna, Austria, where he received a Ph.D. from the University of Vienna. In 1952 he followed his family who had emigrated to the United States. In 1953 he joined a newly founded Benedictine community in Elmira, NY, Mount Saviour Monastery, of which he is now a senior member. In 1958-59 Brother David was a Post-Doctoral Fellow at Cornell University, where he also became the first Roman Catholic to hold the Thorpe Lectureship, following Bishop J.D.R. Robinson and Paul Tillich. After 12 years of monastic training and studies in philosophy and theology, Brother David was sent by his abbot to participate in Buddhist-Christian dialogue, for which he received Vatican approval in 1967. He co-founded the Center for Spiritual Studies in 1968 and received the 1975 Martin Buber Award for his achievements in building bridges between religious traditions. Together with Thomas Merton, Brother David helped launch a renewal of religious life. From 1970 on, he became a leading figure in the House of Prayer movement, which affected some 200,000 members of religious orders in the United States and Canada. For decades, Brother David divided his time between periods of a hermit’s life and extensive lecture tours on five continents. His books have been translated into many languages. Gratefulness, the Heart of Prayer and A Listening Heart have been reprinted and anthologized for more than two decades. Brother David co-authored Belonging to the Universe (winner of the 1992 American Book Award), a dialogue on new paradigm thinking in science and theology with physicist, Fritjof Capra. His dialogue with Buddhists produced The Ground We Share: Buddhist and Christian Practice, co-authored with Robert Aitken Roshi. His most recent books are Deeper than Words: Living the Apostles’ Creed, and David Steindl-Rast: Essential Writings. At present, Brother David serves a worldwide Network for Grateful Living, an interactive website with several thousand participants daily from more than 240 countries. To read more about Brother David, visit his personal site.